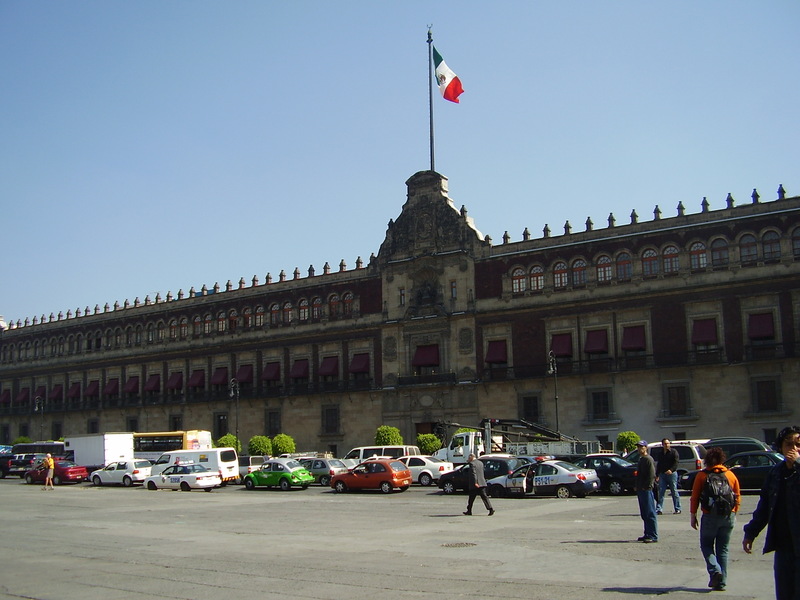 September 2014 – Dia de la Independencia; Viva Mexico! Sonia was borne in Mexico and I spent much of my childhood there. So, our connections to Mexico are strong and no matter where we are, every September 15th we do something to celebrate Mexico’s independence from Spain. Outside of Mexico many people think Cinco de Mayo (5th of May) is Mexico’s independence day – wrong. Cinco de Mayo is the date of a famous battle that Mexico won against French invaders in 1862, almost fifty years after Mexico had won its independence from Spain. The 15th of September is the date celebrated by Mexico signifying its independence from Spain and establishment of the country we know today as Mexico. 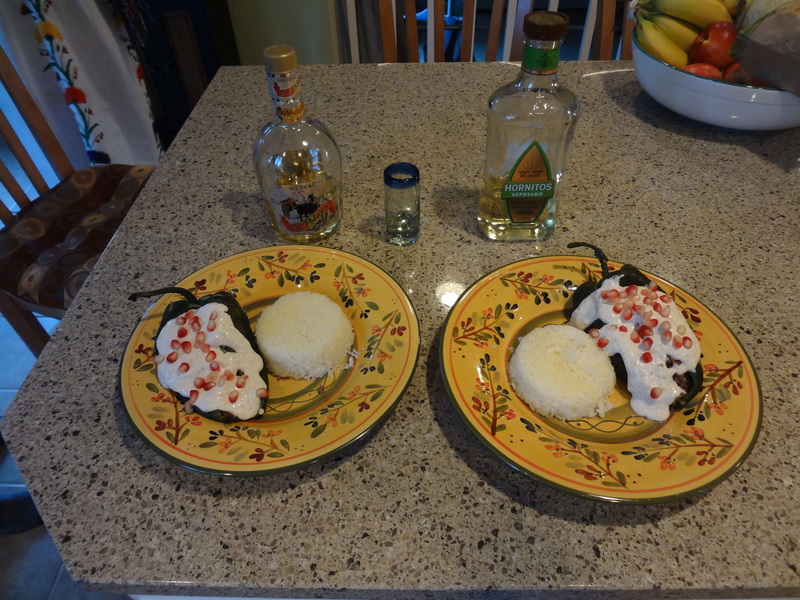 This year we invited another Mexican-American couple over for a traditional dinner of Chiles en Nogada to celebrate La Dia de la Independencia (chiles en nogada – poblano chiles stuffed with a sweetened meat mix and served with a sauce of creamed walnuts sprinkled with pomegranate seeds). This dish was invented to celebrate Mexico with the green poblano chile, white nogada sauce, and red pomegranate seeds representing the colors of the Mexican flag (green, white and red). Sonia is a gourmet Mexican cook and she made the chiles en nogada from scratch; roasting the chiles to remove the skins, blending the walnuts with heavy cream and goat cheese into a creamy sauce (nogada), and then cooking the incredibly complex meat sauce with ground beef, peaches, almonds, spices and sweetened with “pitaya”, a dried fruit made from the tropical pitaya, or dragon fruit. The result is a uniquely semi-sweet sauce, stuffed inside the mildly spicy chiles and covered with the creamy-sweet nogada sauce – it’s incredibly delicious and this fine meal accompanied by shots of a fine mezcal that we had saved from the southern state of Oaxaca (mezcal – a tequila-like liquor made from the maguey, or century plant). Our friends left early since it was a week-day, but Sonia and I stayed up to watch “el grito” (the shout) where the president of Mexico waves the Mexican flag from a balcony of the massive government palace over the crowds assembled in Mexico City’s enormous main plaza. Together the president and the crowd below sing the national anthem, then he rings a bell recalling the start of the war of independence, repeats the names of some of the main heroes of the war (Hidalgo, Allende, Morelos, Guerrero) and ends with the salute – Viva Mexico!, which the crowd enthusiastically repeats. Next year we might attend el grito in Mexico City, or better yet, in the colonial town of Delores Hidalgo where the war of independence began. We attended el grito in 2010 for the bicentennial celebration of Mexican Independence (what a party that was!) and we miss the excitement and ceremony of the whole thing. But first – we’ll celebrate Christmas in Chihuahua, so time to plan that trip first.